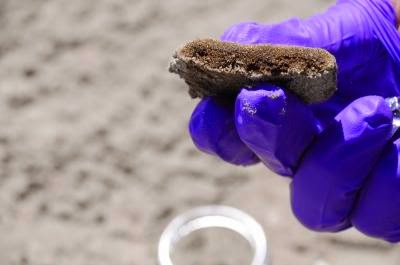 Years after the 2010 Deepwater Horizon Oil spill, oil continues to wash ashore as oil-soaked "sand patties," persists in salt marshes abutting the Gulf of Mexico, and questions remain about how much oil has been deposited on the seafloor. Years after the 2010 Deepwater Horizon Oil spill, oil continues to wash ashore as oil-soaked "sand patties." 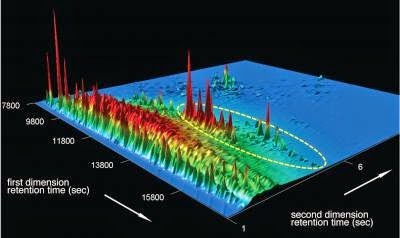 Scientists from Woods Hole Oceanographic Institution and Bigelow Laboratory for Ocean Sciences have developed a unique way to fingerprint oil, even after most of it has degraded, and to assess how it changes over time. Researchers refined methods typically used to identify the source of oil spills and adapted them for application on a longer time frame to successfully identify Macondo Well oil, years after the spill. Researchers used comprehensive two-dimensional gas chromatography (GCxGC) in their oil spill forensics to measure levels of degradation in biomarkers. THe biomarkers here are shown inside the dotted line. "We were looking at two questions: how could we identify the oil on shore, now four years after the spill, and how the oil from the spill was weathering over time," explained Christoph Aeppli, Senior Research Scientist at Bigelow Laboratory for Ocean Sciences in East Boothbay, Maine, and lead author of the study reported in Environmental Science & Technology. Aeppli worked with his then-colleagues at Woods Hole Oceanographic Institution, and University of California, Santa Barbara on the investigation and report. Bigelow Laboratory for Ocean Sciences Senior Research Scientist Christoph Aeppli led a team that identified Deepwater Horizon Oil on shore, years after the spill and after most had degraded. Researchers used comprehensive two-dimensional gas chromatography (GCxGC) in their oil spill forensics to measure levels of degradation in biomarkers. Biomarkers are molecular fossils. Each reservoir has specific amounts of different biomarkers, so oil biomarkers serve as identifiers much like human fingerprints. Biomarkers are usually recalcitrant in reservoirs, but when exposed for a long time to the environment, some are altered due to natural processes. Oil consists of tens of thousands of compounds, and many of them can be degraded by bacteria or broken down by sunlight. This research was designed to determine the resiliency of specific biomarkers and to see how they held up when exposed to environmental conditions on shore. Researchers sought to determine the specific source of the biomarkers degradation. Through analysis of oil-soaked "sand patties" collected along the Gulf shore over a 28-month period, they found that most biomarker compounds were recalcitrant and could be used to identify DWH oil. Some biomarkers, however, degraded. "This knowledge is helping us improve our oil spill forensics. It is providing a foundation for better, longer-term identification techniques that account for exposure of oil to wind, waves, sunlight, and microbial degradation over long times," added Aeppli. Aeppli, Reddy and colleague Dave Valentine from UC Santa Barbara will apply this new oil fingerprinting technique to process tens of thousands of samples collected shortly after the DWH spill. Bigelow Laboratory for Ocean Sciences conducts research ranging from microbial oceanography to large-scale ocean processes that affect the global environment. Recognized as a leader in Maine's emerging innovation economy, the Laboratory's research, education, and technology transfer programs are spurring significant economic growth in the state.